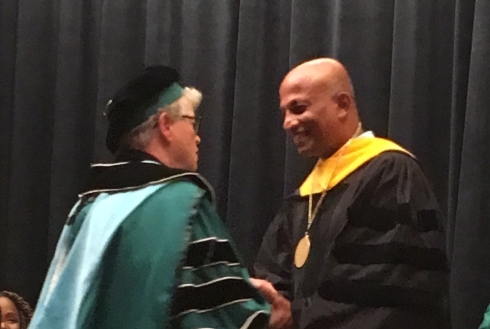 STT’s own Prof. Taps Maiti has been promoted to the endowed and coveted rank of MSU Foundation Professor! President Lou Anna K. Simon and Provost June Pierce Youatt presided over a high-profile ceremony at the Kellogg Conference Center on Friday, September 22, to honor him and all the newly named and endowed professors at MSU. His new rank recognizes Prof. Maiti’s leading national and international role in cutting-edge statistical theory and methods connecting to diverse research fields. His work has been applied to business analytics, medical bioinformatics, and biomedical engineering. Always on the lookout for high-impact applications, he is now working on analyzing data from MSU’s new particle accelerator project: the Facility for Rare Isotope Beams. Congratulations, Prof. Maiti! STT announces the arrival of Leo Neufcourt, who comes to us from the Ph.D. program in Statistics at Columbia University in the City of New York, where he worked on probability theory and financial mathematics under the direction of Prof. Philip Protter. Leo completed his Master's-level research on stochastic analysis and Malliavin calculus under the supervision of Prof. Frederi Viens, Chair of STT, while he was visiting the Center for Stochastic Modeling (CIMFAV) at the Universidad de Valparaiso, Chile. Leo will spend two years as a research associate at MSU, where he will engage in many projects with various teams in STT and other units on campus. Notably, he is already engaged in an exciting new collaboration between STT and the Facility for Rare Isotope Beams (FRIB) where he joins FRIB chief scientist Prof. Witold Nazarewicz and his team, STT Chairperson Frederi Viens, and STT's MSU Foundation Professor Taps Maiti, as they develop new Bayesian tools to quantify uncertainty in nuclear physics models. See the joint FRIB/STT press release here. Leo is also starting a new collaboration with an STT team, as well as Prof. Bengt Arnetz, Chair of the department of Family Medicine, and Prof. Judy Arnetz, Associate Chair for Research in the same department, where they will investigate new predictive models and their Bayesian analyses for improving healthcare outcomes in Michigan. We are very excited about Leo's arrival in STT at MSU, and look forward to his successful collaborations. Along with five other MSU faculty members, Mark Meerschaert has been named as one of Thompson Reuters' Highly Cited Researchers for 2016. The Highly Cited Researchers list is derived from papers that are defined as those in the top 1% by citations for their field and publication year in the Web of Science. 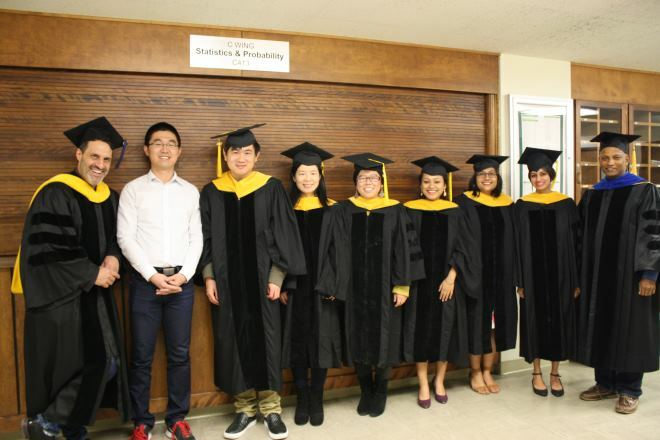 Congratulations to our new PhDs! - The Statistics and Probability Department is proud of our 9 new PhD Students! Viens comes to MSU from Purdue University where he was a professor of statistics and mathematics, and recently completed a term as program director at the National Science Foundation in Arlington, Virginia. At Purdue, he also served as director of the computational finance graduate program for more than a decade, and as associate director of the actuarial science undergraduate program, in which he designed new SOA-compliant courses and restructured offerings. Prior to that, he was assistant professor of mathematics at the University of North Texas, and an NSF postdoctoral fellow in Barcelona and Paris. Peter Bühlmann - James Francis Hannan Visiting Scholar - We are honored to have internationally renowned statistician Professor Peter Bühlmann, ETH, Zurich, visiting the MSU Department of Statistics and Probability as a James Francis Hannan Visiting Scholar, for the week of November 12 to 18, 2016. He will be giving two talks, Hierarchical High-Dimensional Statistical Inference on Tuesday, November 15, and Inhomogenous Large-Scale Data: New Opportunities for Causal Inference and Prediction on Thursday, November 17. A Workshop on Future Directions in Fractional Calculus Research and Applications - MSU is proud to host a workshop on Future Directions in Fractional Calculus Research and Applications October 17-21. Catastrophe models have been used by the insurance industry for the past two decades and they have evolved significantly over that time period. Even though they incorporate scientific theory and engineering expertise, the models are statistical in nature and utilize many of the techniques applied in standard actuarial analysis. Recent innovations in the catastrophe risk management space promise to revolutionize the field over the next few years. Statistics in Applications Symposium 2014 - MSU is proud to host the Statistics in Applications Symposium with keynote speaker Daniela Witten on October 3, 2014. Persi Diaconis - The Search for Randomness - We are pleased to announce the inaugural John Kinney Memorial Lecture by Persi Diaconis, titled 'The Search for Randomness' on Thursday, August 29, 2013 at 10:20 AM in Room 1400 of the Biomedical and Physical Sciences Building. Click here for more information. IYS2013 @ MSU - As part of the International Year of Statistics event, MSU was proud to host the Statistics in Applications Forum with keynote speaker Dr. Trivellore Raghunathan on October 1st, 2013. Click here for more information. Persi Diaconis - Colloquium - TIME CHANGED During his visit, Persi Diaconis will be giving a colloquium talk titled 'Mathematics and Statistics for Large Networks' on Friday, August 30th at 10:20AM in room C405 Wells Hall. Click here for abstract. 2013 NSF/CBMS Conference - The 2013 NSF/CBMS Conference 'Analysis of Stochastic Partial Differential Equations' will be hosted by the MSU Department of Statistics and Probability, with Principal Lecturer, Davar Khoshnevisan (University of Utah). Dr. Chae-Young Lim and Dr. Sarat Dass win the Frank Wilcoxon Award - Dr. Chae-Young Lim and Dr. Sarat Dass were selected as the winners of the Frank Wilcoxon Award in September 2012 for best application paper for their paper on "Assessing Fingerprint Individually Using EPIC: A Case Study in the Analysis of Spatially Dependent Marked Processes" in the 2011 issues of Technometrics. Peter J. Bickel--James Francis Hannan Visiting Scholar - We are honored to have internationally renowned statistician Peter J. Bickel, Professor Emeritus, UC Berkeley visiting the MSU Department of Statistics and Probability as the first James Francis Hannan Visiting Scholar. Prof. Mandrekar Awarded Fellowship - Professor Mandrekar has been awarded a National Research Council Fellowship by the National Academy of Science. He will be a Senior Associate at the Naval Post-Graduate School in Monterey, CA. Faculty Position in Mathematics - Michigan State University invites applications for a tenure-track, Assistant Professorship, 75% in MSU's Lyman Briggs College (LBC) Mathematics group and 25% in the Department of Statistics and Probability (STT). Large Sample Inference For Long Memory Processes - Book published: written by Liudas Giraitis, Hira L Koul & Donatas Surgailis. The paper of Professors Lim and Dass are published in Technometrics. - The paper of Professors Lim and Dass on "Assessing Fingerprint Individuality Using EPIC: A Case Study in the Analysis of Spatially Dependent Marked Processes", published in Technometrics, 53 (2011), no. 2, 112–124, has been chosen as the recipient of the ASA's Outstanding Statistical Application award for this year. Since nominees can come from any journal or monograph, the award is quite an honor. Professor Tapabrata Maiti - has been elected to be a Fellow of the Institute of Mathematical Statistics in 2012. The International Year of Statistics (Statistics2013) - The International Year of Statistics ("Statistics2013") is a worldwide celebration and recognition of the contributions of statistical science. Through the combined energies of organizations worldwide, Statistics2013 will promote the importance of Statistics to the broader scientific community, business and government data users, the media, policy makers, employers, students, and the general public. Lijian Yang has been appointed as an Editor of Sankhya, Ser B. - , one of the prestigious journal of statistics. Featured article in May issue of Technometrics - The article "Assessing Fingerprint Individuality Using EPIC: A Case Study in the Analysis of Spatially Dependent Marked Processes," by the two faculty members of the Department, Chae-Young Lim and Sarat Dass, which appears in the May issue of Technometrics, has been selected by the Editor Hugh Chipman of the journal to be the issue's Featured Article. Shujie Ma - has won the CHINESE GOVERNMENT AWARD FOR OUTSTANDING SELF-FINANCED STUDENTS ABROAD. She is one of the 23 winners from the Midwest of this award, and the only MSU student winner for this year. Professor Yimin Xiao has been elected to be a Fellow in the Institute of Mathematical Statistics, 2011. Peter Hall visits MSU Department of Statistics and Probability - Internationally renowned mathematical statistician Professor Peter Hall, FAA, FRS,visited the MSU Department of Statistics and Probability from March 21 to April 1, 2011, and gave a public lecture (March 22) and 2 additional lectures ( March 24 March 29 ) during his visit. Probability at Michigan State - The research group in probability theory at Michigan State University includes faculty and graduate students from the Department of Mathematics and the Department of Statistics and Probability. Dr. Maiti named ASA Fellow - Statistics Professor Tapabrata “Taps” Maiti has been named a Fellow of the American Statistical Association (ASA). Maiti is Graduate Director for the Department of Statistics and Probability and was presented the award at the Joint Statistical Meetings in August of 2010. William L. Harkness Award - The William L. Harkness Award was presented to Dr. Dennis Gilliland , Wenning Feng and Kai Zhang on November 9, 2010. Bose-Nandi best paper award for Maiti and Chen - “Analysis of cDNA Microarray Experiment with External Controls: A Mixed Model Approach" had been adjudged as the best publication in the Section ' Applications of Statistics" appeared in Volume 59( 2007) of Calcutta Statistical Association Bulletin.